The porosity of brick and mortar make paint removal troublesome, and it might take a combination of methods to restore a painted brick wall to its original condition. 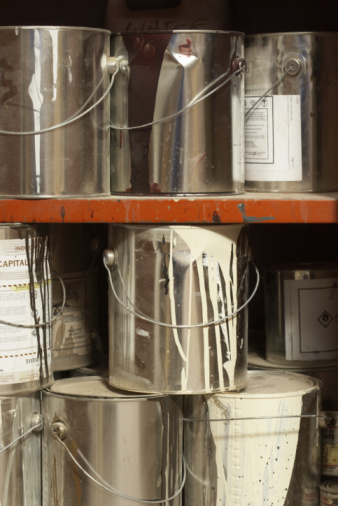 Even if you're only interested in removing overspray left by a careless house painter or graffiti left by an urban artist, you may find the need for both chemical and mechanical removal methods. To avoid damaging the brick and mortar, it's best to begin with the least intrusive stripping methods and progress to more aggressive ones only if necessary. You can usually remove paint from wood with nothing more than some paint stripper and a paint scraper, but removal from brick is not so straightforward. Depending on the thickness of the paint and the condition of the brick, one or more of a number of chemical and mechanical methods may be needed. Paint strippers -- You can use the same paint strippers on brick that you use to remove paint from wood. Stronger ones usually contain highly caustic methylene chloride, and safer, slower-acting ones may contain citric acid or soy derivatives. Peel-and-strip -- Some stripping products are designed to be covered with a layer of paper. The paper keeps the stripper moist, so it remains active, and the stripped paint is supposed to adhere to the paper and simply peel off when you remove the paper. Muriatic acid -- This is the go-to cleaner for brick and concrete in general. It's corrosive and must be handled with care, but muriatic acid will dissolve paint that has seeped into deep pores and lodged between the bricks and mortar, as well as efflorescence masquerading as paint. You need to wear goggles, rubber gloves and protective clothing when using it. Trisodium phosphate -- A strong soap solution may be all you need to remove light overspray. TSP acts as a paint stripper in some circumstances, and combined with a scrub brush and protective clothing, may just do the job. Scrub brush -- Scrub the brick with a hard-bristle scrub brush after applying muriatic acid or TSP to loosen surface paint and remove it. Wear protective clothing, gloves and goggles. Pressure washer -- A pressure washer provides a quick and effective way to remove all kinds of dirt and grime from brick, and it can remove old paint. It's best used in conjunction with a chemical stripping method to avoid the need for spraying a close quarters, which could damage the brick. Sand blasting -- When all else fails, call the sand blasting company. Sand blasting is a job you can do yourself, but it's such a messy and noisy procedure that you probably wouldn't want to. Pros can not only handle the job more efficiently than you, they know what blasting medium to use to remove the paint while protecting the brick. Before using any paint removal method, cover the ground around the wall with dropcloths to catch paint flakes and other debris. This greatly simplifies your cleanup. Assess the difficulty of the job. Removing several layers of paint is more difficult than scrubbing off some overspray or graffiti. Assemble the materials and tools you need beforehand so you don't have to leave the wall unattended while it's coated with paint stripper or acid. Apply paint stripper -- if needed -- using a paintbrush; scrape it off using a paint scraper and scrub brush. If you decide to use muriatic acid, mix the acid with water -- not the other way around -- and pour the mixture into a garden sprayer so you can spray the acid on the wall. You may also opt to simply try to remove the paint with TSP and water. Scrub well when using muriatic acid or TSP, and then rinse with a pressure washer or -- if the paint comes off easily -- a garden hose. It's important to rinse every time you use either of these cleaners, because they can damage the brick if left on.